What you’ll need: two paper plates, construction paper, markers and/or paint, and glue. Start by coloring (with markers, crayons or paint) the one paper plate solid green; this will be the body. Color the other paper plate a pale skin color. Take a sheet of orange construction paper and cut it into rectangular pieces about two (2) inches long and half (1/2) an inch wide. 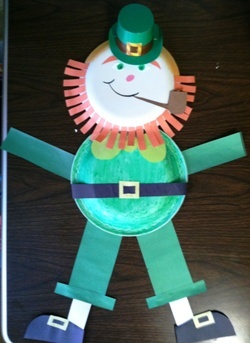 Glue these pieces to the edge of the skin colored paper plate as the leprechaun’s beard. Cut two (2) curved orange pieces the same size, but glue these on the plate where eyebrows would go. Draw on the eyes, nose and mouth of the leprechaun. For the hat you can either cut one out or be really creative and use a Mini Green Top Hat with Buckle Band. To attach the mini hat, poke two holes into the plate and four holes into the mini hat. Thread string through the holes so that the hat is connected to the plate and tie it in the back. Or, you can use a hot glue gun and glue the hat to the plate. Take a few more pieces of green construction paper and cut them into pieces for the arms, legs and a bow tie. Attach the bow tie slightly under the paper plate head. Overlap the paper plate head and body and glue them together. Attach the arms at the side of the paper plate body and the legs at the bottom. Cut out another black strip and yellow rectangle; glue them down as a belt and belt buckle. Cut out two (2) thin strips of white construction paper and attach these to the green part of the legs. Then, cut out two (2) black shoe forms each with a yellow rectangular buckle shape and attach these to the bottom of the white pieces. Optional: take any left over orange, or brown, construction paper and cut it into the shape of a pipe. Attach it to his mouth so that he is smoking a pipe.